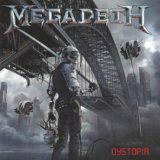 Given the absolute nadir that was Super Collider, my expectations for the new Megadeth album were low at best, and so Dystopia is something of a pleasant surprise for me. Those holding out for Rust in Peace pt 2 will, as ever, be disappointed, but if you finally accept Megadeth as a heavy metal band rather than a thrash band given it's been a good four (or arguably, eleven) full-length albums since Dave & co's last pure thrasher, you won't be let down. There's a hunger audible here that was missing previously, a ferocity in the lyrics and riffs that makes for a solid, enjoyable listen for fans. What criticism I've seen elsewhere of the album is often bordering on the ridiculous, the AV Club claiming that Mustaine's conservative lyrics are xenophobic and negate anything good about the album, while elsewhere people have complained about Dave's singing voice, as if he used to have the abilities of Demis Roussos (RIP)! Admittedly, Iced Earth did the dystopian concept thing much better a few years ago, and even Megadeth has tackled similar topics better in the past. Yet what really matters, as ever, is that Dave is motivated and has assembled a top team of hired hands to make this, the fifteenth Megadeth album, the best in years. Dave Ellefson is as solid as ever on bass, while session guitarist Kiko Loureiro (Angra) and drummer Chris Adler (Lamb of God) more than round out the band. The album starts strongly with The Threat Is Real, a rumbling statement of intent introduced with Middle-Eastern wailing and percussion before kicking into a thrashy stomper, getting even better on the title track. Possibly the best track on the album, this moves from a melodic opening to some sweetly old-school riff and solo-trading, about as Rust in Peace-y as it'll get all these years later. There's a step down in quality after that very strong opening; maybe not easy to tell with the bass-heavy Fatal Illusion, but a little more obvious with the fairly forgettable Death From Within. Thankfully Bullet to the Brain's melodic catchiness makes up for it, as does Post American World, which could have been pulled from Countdown to Extinction, but it's a bit of a mixed bag after that. Poisonous Shadows is a weirdly power-metal-esque take on late 90s Megadeth song complete with piano, adding a bit of interesting variety but not much else, whilst the acoustic opening to instrumental Conquer or Die saps just too much energy even with some ensuing chug. Lying in State is a thrashy catchy stomper, The Emperor is closer to hard rock (albeit with a great solo) Fear cover Foreign Policy is fun in a throwaway kind of way. None of it is as good as Endgame, the real post-millennial Big Four thrash comeback – instead it's more akin to United Abominations, in that it's a solid album with depressing themes that has been surpassed by other Megadeth albums but is worth hearing anyway. Still better than recent outings from Metallica and even Slayer, Deth is truly eternal.